Jumping on a horse, tying myself with ropes to a thing called paraglide, milking a cow while standing in the cow dung up to my ankle, wearing playful miniskirts with rubber boots, accentuating my cleavage with womanly dresses, listening to all the stories he had to tell about the thousand and one things he did, talking myself without stopping about the thousand and one things I did , not challenging him with my concerns I had, confronting him with questions he feared most, complimenting him on everything, not even looking at him, writing passionate blog posts, taking planes way to often, disappearing for a while - nothing really worked to impress this superman enough. It think somewhere in the beginning I already got to understand that this was a clinical case but as many women do in the clinical cases – I had decided to take up the challenge. One fine evening I was cooking for him. I had opted for eggplants. There is something terribly sensual about that vegetable. The deep purple color of its skin intrigues you, flash of a fried eggplant soaks in so much oil while cooking that its flavor becomes seductively rich and complex, leaving you content but at the same time dying for more. Pair it with some oil and garlic and the result will be a luxurious dish that would spoil even the most spoiled person. 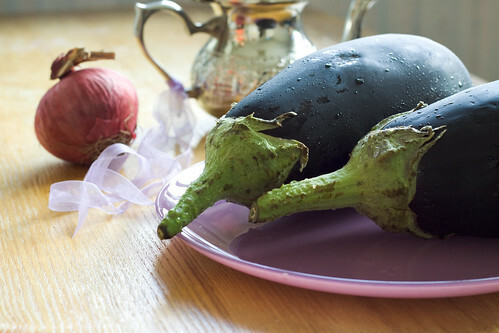 There is also some oriental Scheherazade feel to eggplant which I probably got from sampling various dishes created from eggplant when traveling in Turkey or Morocco: I think eggplant and I think narrating stories for one thousand and one nights, giving food and making the sultan loose his mind. Hm, lets see if this rough man could resist my mood of seduction, - I thought as I stood on my kitchen and pictured myself as a goddess-like Aishwarya Rai from the "Mistress of Spices". Too bad my hear was not that long and black, the waistline was not that delicate and I wore jeans on instead of a see-through silk and gold saree but I did not care much that very evening. Speaking of spices though… on my recent trip to Morocco I did pay a very productive visit to a local spice shop. Interestingly enough, spice shops in Morocco are jokingly referred as Berber pharmacy. Well, "Berber" because everything is Berber in Morocco when sold to tourists as this immediately makes goods eligible for a premium. And as for "pharmacy"… the things is these shops offer remedies for almost any disease or sorrow: colorful powders useful against magic, fragrant rose perfumes for attracting love, flower mixtures and roots for beauty, argana oil for everything and spices for creating delicious meals that could easily make a man yours forever… A few hours in the spice shop resulted in my kitchen cupboards getting stocked up with the aromas of freshly ground cinnamon, cardamon, cumin, nutmeg, red chili, ginger, Ras el hanout (literally head of the shop, or special blend of most popular spices) and saffron threads. Back to my cooking though: I made an inventory of the ingredients I was about to throw in the sauté pan and realized that according to yogic and ayurveda diet traditions I was about to cause a volcano emission. Eggplants are reputed as most powerful aphrodisiac giving energy to a woman, garlic and onion are said to improve blood circulation and sexual performance of a man, cardamon appears to boosts appetite (all kinds of it), ginger is believed to boost life energy and fertility, while cinnamon enhances sensuality, saffron is said to boost stamina and sexual desire as well as create happy feelings, and coriander is responsible for providing overall vitality. A dangerous armory of aphrodisiacs! I served the dinner in the living room with a low table and cushions thrown on the floor, to the melting candles, to the soothing sound of Arabic and Portuguese blend of the lounge music. The eggplants came on the large plates with flat bread to be eaten with hands .. eggplants have to eaten with hands when you feel a genuine unity with what you are eating and let the primal instincts in you thrive. I was watching the guy as he was trying to keep cool and not paying attention to the stage decorations I had set up and the performance about to envelop. We kept eating, talking, talking more, having strong and intoxicating coffee a la Turka, talking, kissing, not hearing the music any more and only sensing each other… Later on as he was sitting on the bed and contemplating the experience of the past hours he said, "It was unbelievably delicious!". Eggplant? Me? Portuguese whispers? Berber magic? Serendipitous position of the stars in the sky on that evening? I will never find out but I don't care as far as I keep the recipe...for the challenging cases to come. 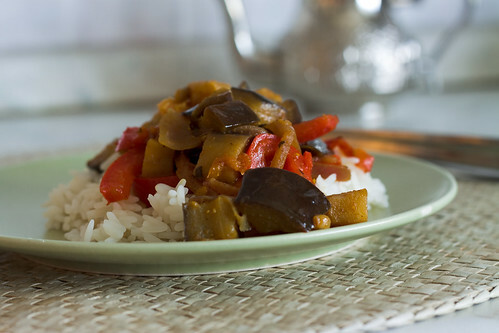 Soak eggplant: Cut eggplant into the cubes with a side of 1.5 sm and place the cubes in the salted water – this way they will turn out juicier without absorbing enormous amount of oil when cooked. Get it cooking: Put 3 tbsp olive oil on a preheat sauté pan and add crashed garlic and chopped onion. Cook on the medium flame until golden brown shaking vigorously now and then. Add carrots, paprika, soaked eggplant and 3 tbsp olive oil to the sauté pan, stir and fry uncovered on the medium flame for 5 minutes. Then add tomatoes, the ground spices and salt and leave it simmering under the lid for 10 more minutes. Final touch: Sprinkle with fresh coriander and serve with plain rice or flat bread. Consider yourself warned! That sounds yummy! I love eggplant. I enjoyed your story too. thank you very much Tovie!